This narrow branch of yew (Taxus baccata) had been cut down and left to dry quite some time ago with the ends sealed to prevent splitting. 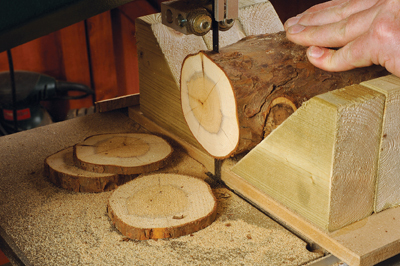 Being roughly round in shape demanded a safe way of cutting the log into slices. 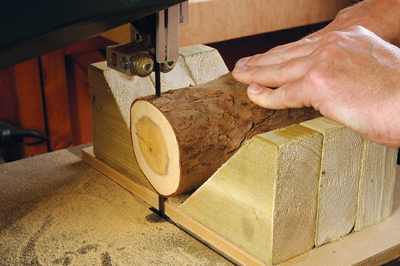 The simplest is to place a wedge under the leading edge of the log before feeding it through the bandsaw which prevents it rolling and snatching on the blade dangerously. We went one better and made a cradle to hold it more securely. 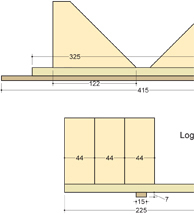 Cut six blocks of 50mm wide prepared softwood with a 45° bevel on each block. 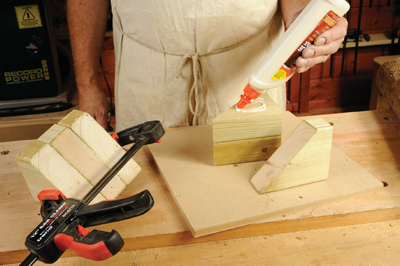 Line them up in two sets of three and glue and clamp them in a pack. 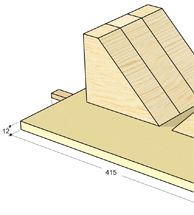 A mitre saw is the best way to get accurately matching shapes. 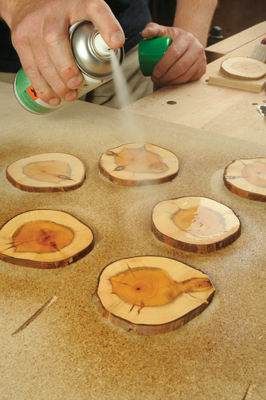 Apply glue to each pack and rub into position on a piece of 12mm MDF aligned along one edge. 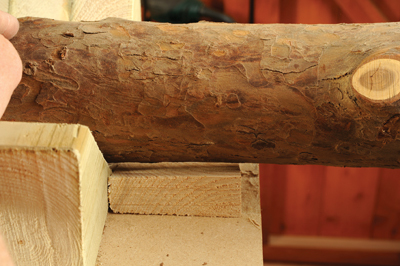 Check the log will sit down properly between them and then leave the bevelled pieces to set. 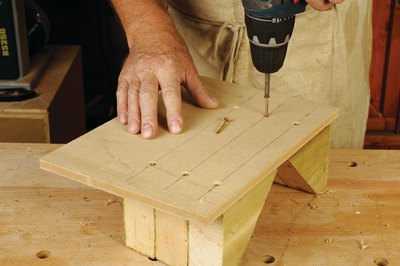 Now turn the board over and drill and screw the blocks so they are properly secure. 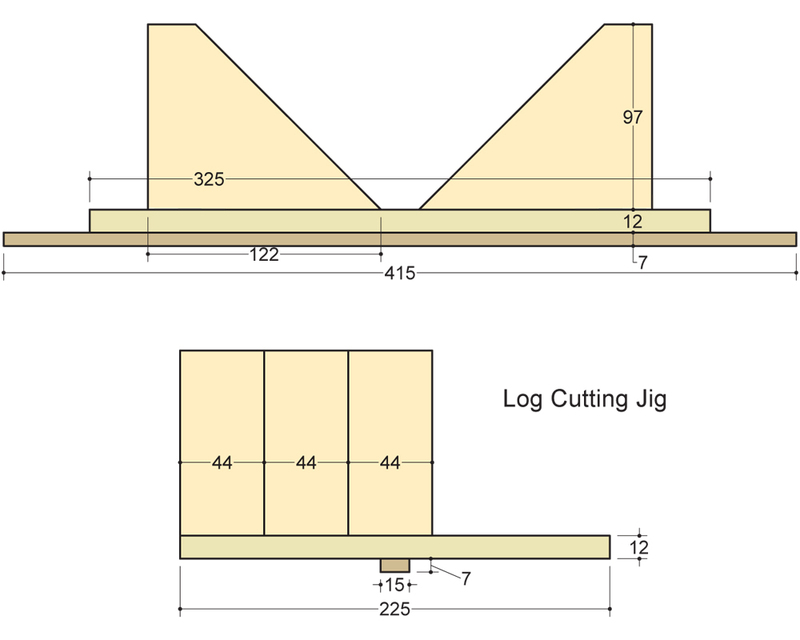 Small panel pins are then tapped into the bevelled slopes and the heads nipped off with pliers to lock the log in position so it cannot turn while you are working. 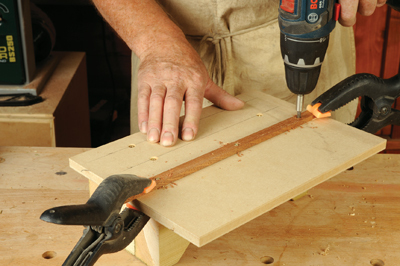 Most bandsaw tables have a slot for a mitre protractor. 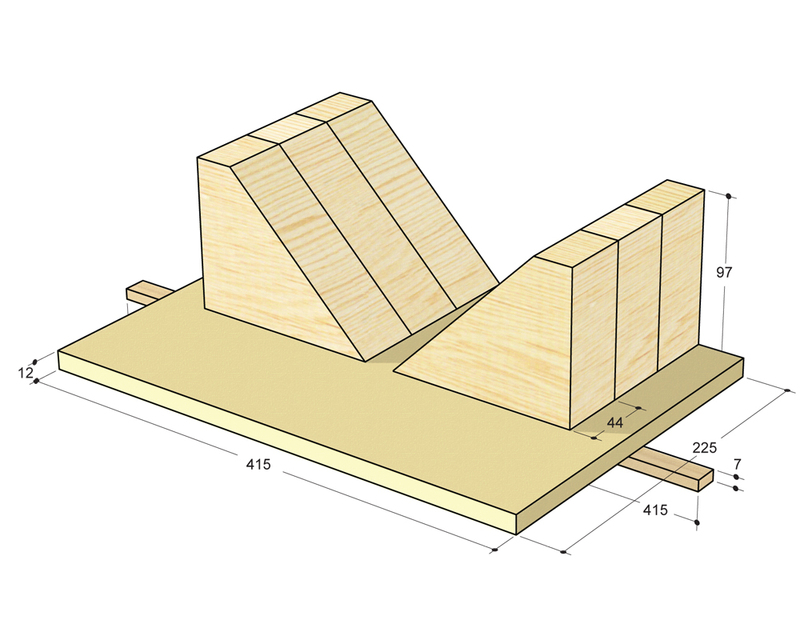 We made a hardwood strip to fit the slot on the Record and screwed it in a position that allowed the cradle to just clear the bandsaw blade. 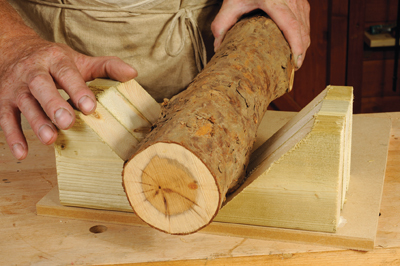 A wedge is needed under the outer end of the log and can be pushed underneath until it sits nicely in the cradle. Several experimental slices were made which removed any minor splitting and the end seal. This is the first really clean cut. Several goes later and we were ending up with consistent parallel slices that were showing definite promise. There was plenty of log left so we could easily afford to waste a few that werenâ€™t so good. 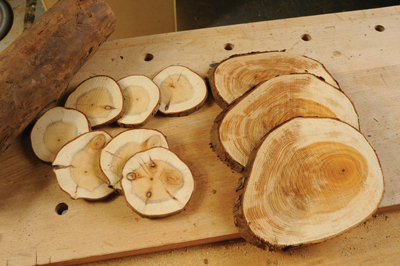 Our raw slices are on the left here, we also tried some larger wet log slicing on a bigger bandsaw and you can do the same within the capacity of your machine. 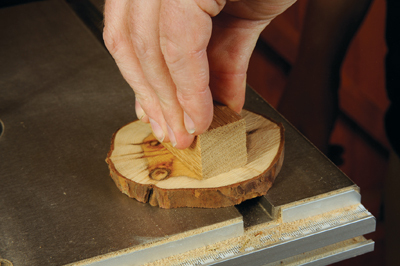 You could also try making a slanted cradle for oval slices if you wish. 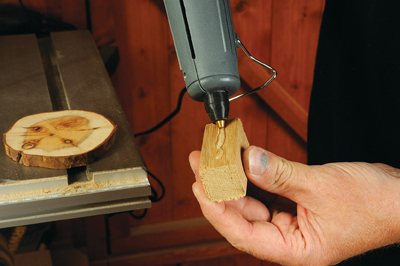 Use a dab of hot-melt glue on a small block as a safe hand grip device ready for sanding. Press it down firmly while the glue is still hot. It can be pulled apart later. 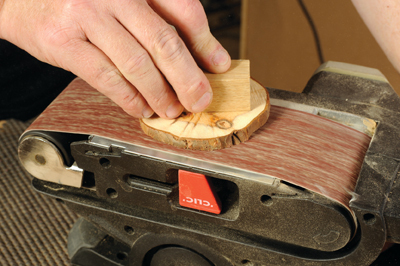 Applied to a standard belt sander, the faces can be sanded smooth. Do both faces and check they stay fairly parallel or your drinks will be on the skew! 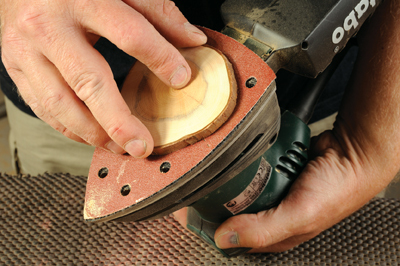 For a finer finish you can take the coaster to an orbital sander quite safely and get a nicer bare finish ready for sealing. 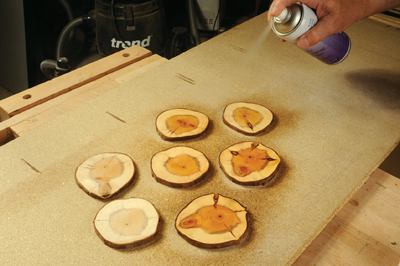 Spray a coat of cellulose sanding sealer on both faces allowing to dry between coats. Do this in a well ventilated area with no naked lights! Flat off and denib using a piece of Webrax sanding grid ready for the finish coat. 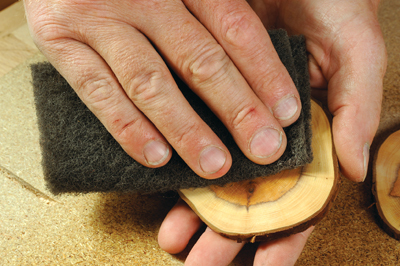 You can use fine abrasive if you do not have any Webrax available. This time apply a satin lacquer finish, again with good ventilation for your safety. 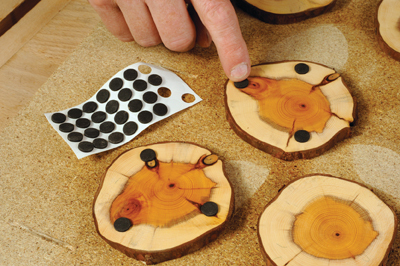 Press small self-adhesive rubber pads on to the undersides so the coasters stay put and do not rock at all. 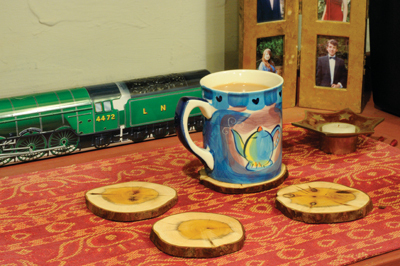 Now it's time to put the coasters to good use!